I have moved out of three residence halls in three years and can tell you for certain: it can be a lengthy process. On top of studying for finals and thinking about summer job options or plans, you have to figure out how you are going to empty your room. And somehow, you’ve accumulated so much stuff that you’re leaving with even more than when you arrived in August! Remember all those boxes from move-in day? Here’s my advice on how to handle the chaos that is move out: be proactive and think ahead. If you happen to be going home in the next couple of weeks, I would take home anything that hasn’t been touched since January. If you haven’t used it since then, there’s a strong chance that you won’t be using in the last four weeks of the semester. Also, consider taking anything large or space-consuming home earlier. This way, you don’t have to worry about handling large objects when it’s closing time. Otherwise, it can probably go. Fewer distractions may even mean more studying, who knows? Speaking of studying, your exam schedule is going to be what dictates your move out schedule the most. Once you have your exam schedule, coordinate your move out time accordingly. 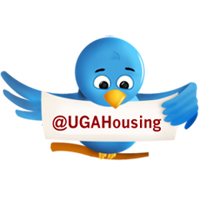 Residents will receive information from their area coordinators soon relating expectations for move out. In addition, your RA should have information about the closing process and will most likely host a meeting. I suggest having a move out time already planned and in mind before that meeting. Your RA could have their availabilities schedule with them, and you’ll definitely want to take advantage of that! Planning ahead now will ensure that you don’t get caught up in the heavy move out days. My freshman year, my last exam was on the very last day of finals at 7 p.m. Not ideal. However, I got a lot of the heavier items out of my room earlier in the semester, so I really didn’t have much stuff to move out. Have a water bottle with you when you’re moving out! It can be a labor intensive process and it can get very hot! Stay hydrated! If you and your roommate are moving out on the same day, maybe you can develop a plan to help each other with getting the heavier items out. Be patient with your RA. I can speak from experience that it’s a very specific process and sometimes the RAs do checkouts back-to-back-to-back all day. My record is 32 checkouts on a single day. So please help us out and be patient. Each RA has a list of expectations for move out that you’ll need to review; trust me, it helps the process go a lot more smoothly. It’s crazy to that it’s already time to think about moving out! So many of you were making your move-in plans not that long ago! Have a great rest of the semester and good luck studying for your finals. These are great tips, Danny! Packing is what some people hate when moving in or out. It's because of the stress it causes. But having a guideline like this, I'm positive packing would be fun, especially if you have all the things you need in packing like boxes, tapes, plastic bags for trash and so on. When I checked in my dorm the one thing I found a shortage of was storage space. I had to share a closet with two roommates! I found an eventual solution in plastic moving boxes, that I could still under the bed or stack in the closet. Not only did it help me keep my stuff organised (and separated from my roommates' junk) but the boxes were reusable so when it was time to move out I could use the same boxes over again! Admiring the time and effort you put into your blog and detailed information you offer.Thanks.